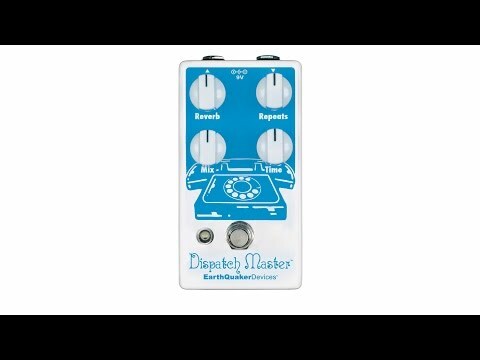 Product Overview The Dispatch Master is a hi-fi digital Delay & Reverb Device that combines independent delay and reverb effects into one space-saving enclosure, so you can keep deep ambient echoes (or just a quick slapback) on speed-dial. • Mix: The Mix control is a wet/dry blend that adjusts the overall level of the affected signal. • Time: Sets the delay time from 0ms to 1500ms (1.5 seconds). • Reverb: Controls the amount of reverb. Counterclockwise is less reverb, clockwise is more reverb. • Repeats: controls the regeneration of the delay signal. When the Repeats control is set to maximum, you’ll get infinite repeats without runaway self-oscillation, which makes it great for creating drones, dialing in the ultimate post-rock guitar sound without feedback, or just having fun. - Turn the Reverb control all the way down. - Adjust the Time, Repeats, and Mix controls to taste. - Turn the Time and Repeats controls all the way down. In Reverb-only mode, the Repeats control has a secondary function. It can be used to adjust the decay, depth, and tonal quality of the reverb! Turn it up for more dynamics and a thicker tone.